In this post, I am going to talk about how to configure FreeSWITCH in a high availability active-passive schema. The active-passive approach will share a floating IP between your VoIP switches and when one gets off-line, the passive one will take control over the IP and it will get the load. 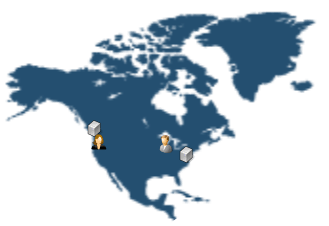 For more information about how this works, I strongly suggest you to read my article about the High Availability Cluster Overview; you will understand what you are going to do. You know how to sync files between your FreeSWITCH servers. Start the pcsd service on each node and then type pcs cluster auth freeswitch-1 freeswitch-2, you will be asked for a username. It is a good idea to use hacluster username, as CentOS RPM's will do all the privilege setup for you. You will be asked for the password. If all goes for good, you will have no errors. After that, you can type pcs cluster setup --name cluster_name freeswitch-1 freeswitch-2. If there is no error when you type pcs status or crm status you will see your nodes. You might want to restart corosync and pacemaker services. To be sure, check your /etc/corosync/corosync.conf configuration file, both files should have the same. Here it is my config file, do your changes to fit your needs. Please make sure the hostnames you use are resolvable. You will also need to add an IPTables rule to warrant free traffic from and to port 5405/udp. You must make the hostnames of your nodes resolvable, you can do this with your DNS or by editing your /etc/hosts file on each file. It is up to you. You can start the corosync and pacemaker daemons on each node. Use the command service or systemctl, for example, service corosync start and service pacemaker start. Type crm status to verify all is good, you shall see nodes names. You can read the current configuration by typing crm configure show. When you are done, you need to add tracking call to your FreeSWITCH profiles configuration. Add the tag <param name="track-calls" value="true"/> on them. The way you do this depends on your deployment; for example, if you are using my FusionPBX RPM's, it is done by adding it using the web interface, as FreeSWITCH uses the MySQL/MariaDB to get the profiles-config. You need to add the <param name="odbc-dsn" value="odbc://dsn:username:password"/> as well. You may want to do this on all configuration files that support dsn to allow data sharing as much as possible. In order to be able to let the switch to take the load of the other, they need to have the same name. But don't worry, this is not the hostname, it is the switchname variable, which it is completely different. You can edit the switch.conf.xml file (usually in /etc/freeswitch/autoload_configs) and add or modify the tag <param name="switchname" value="freeswitch_name"/>. Next step is to create the pacemaker resource in order to make the floating IP. You can do this by typing crm configure primitive ClusterIP ocf:IPaddr2 params ip=FLOATING_IP cidr_netmask=FLOATING_IP_CIDR_MASK nic=eth0 iflabel=ipha op monitor interval=10s or pcs resource create ClusterIP ocf:heartbeat:IPaddr2 ip=FLOATING_IP cidr_netmask=FLOATING_IP_CIDR_MASK op monitor interval=10s when you are done, type crm status to see if all goes for good. Remember to change FLOATING_IP for the correct numeric IP, and FLOATING_IP_CIDR_MASK for the proper (usually this will be 32, but that depends on your network environment). If you do a mistake, you can delete the resource by typing crm_resource --clear --resource ClusterIP. If you are using Digital Ocean, you may want to read my newest article about how to configure the floating IP for an HA cluster. Because Digital Ocean's floating IP approach is done through a NAT, the approach is different and there is a side-effect you must be aware of. And you are done, test it. The next step is letting know the FreeSWITCH what to do when it is the new active node. For that, I have published a modified version of a FailOver Resource for Pacemaker, you can download it at https://github.com/OKayMX/resource-agents-failover-script or if you are using my OKay RPM repository just install it via yum command, the name of the package is resource-agents-failover-script. Create a file in the /usr/libexec/failoverscript/ directory. The name is not important, but remember that Linux sorts it, so a name with 00- at the beginning will warrant you it will be executed first. Put something like: /usr/bin/fs_cli -x 'sofia recover' and make it executable. If you have a buggy router, you may need to add /usr/sbin/arping -q -c3 -A -i interface FLOATING_IP. When the active node becomes unavailable, the passive will take over. Your end users who are having a conversation at that moment will notice some 2-3 second dead air effect. After that little silence, there should not be an issue. You may use the passive node for any other VoIP task such as CDR Importing; doing some special configurations, you may be able to exchange tasks. The server switch will only happen when the actual active server stops answering. A slow server is an alive server. Endpoints who are registering using TCP may need to re-register. Because TCP uses a sequence number to prevent the session to be stolen, this protection prevents the new server to continue the actual connection. So, best case scenario is using SIP through UDP. The approach I am explaining in this post shows an Active-Passive scheme with floating IP. This means that the first server will take all the load until it fails. Sometimes, you may need to spread a little the load. If you are looking for the active-active and load balanced cluster configuration, I will post later how to do that. Active-Active with floating IP without Kamailio: all nodes must be on the same local network. The balancer will be responsible of load balancing, and the FreeSWITCH boxes will be the responsible to do inter-switch connections (if a user in box A is calling a user in box B, they should connect). Active-Active without floating IP without Kamailio: nodes must be spread around the globe. This balancing approach uses the smart DNS add-on I coded myself, this will be the responsible to do the balancing. So, this way you can warrant your endpoints connects to the fastest and closest server available. Anyway, the FreeSWITCH servers will need configuration in order to do inter-switch connections as well. You may want to read the Balancing, Clustering and High Availability for FusionPBX article to know a little more about this approach. You can always contact me for support. Remember this is an advanced topic.